Hello all! We have drawn almost all of the monsters that live in Murb. There are only a few left to go! However, the How To Draw lessons are taking a vacation while we figure the best way to do the last few monsters. Starting January 10, 2011, you will see more monsters and much more Murb fun here on the blog. Until then, enjoy drawing the other monsters and reading interesting news from around Murb! This week's monster is Diamondhead! Diamondhead loves diamonds. He is small, but strong and helps people a lot. His favorite colors are blue and red. He is the richest man in Murb and is always willing to help people out. Thanks to Ty P. from New Jersey for this cool monster! Step 1: Draw a slightly curved triangle for Diamondhead's head. Step 2: Add more lines for the top of his head. Step 3: Draw the sections of the diamond. 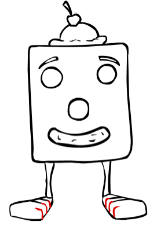 Step 4: Using straight lines, start drawing the braces for his head. Step 5: Continue drawing the braces. 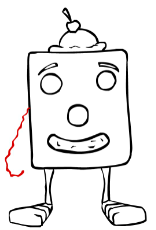 Step 6: Draw in the braces that are behind his head. 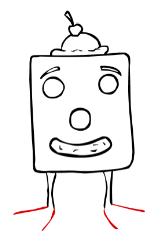 Step 7: With lots of curved lines, draw Diamondhead's nose, smile, and eyebrows. Step 8: Add in his eyes. Step 9: Straight lines and rectangles make up his glasses. Step 10: Draw his shirt with some curved lines. Step 11: Using curved lines, draw his belt and the top of his shirt. Step 12: Finish drawing Diamondhead's shirt. 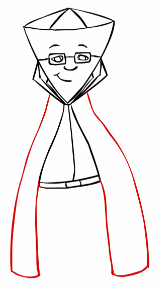 Step 13: Using curved lines, draw in the rest of his jacket. Step 14: Add in his pants. Step 15: Drawing Diamondhead's arms should be easy with just a few curved lines. Step 16: His shoes are created with straight lines at angles to make kite-like shapes. Step 17: Add in the extras and color in Diamondhead! How to Draw: Jelly Bean! 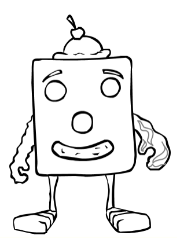 This week, our monster drawing lesson brings us a fun, athletic, candy-eating monster named Jelly Bean! 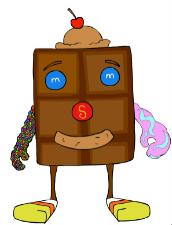 Jelly Bean loves candy and playing football. Want to know a secret? Her mom just got her candy corn shoes and cotton candy. She always has candy for people in Murb. Thanks, Cassidy R. of Texas! 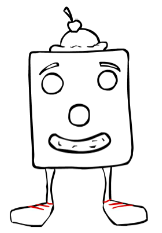 Step 1: Draw a square with rounded corners for Jelly Bean's body. Step 2: Draw three circles for her eyes and nose. Step 3: Add in her smile! Step 4: While this kinda looks like a hat, it is really ice cream! Draw a half circle with two curves at the bottom to draw the ice cream on Jelly Bean's head. Step 5: Draw a cherry on top! Step 6: Add all of the extras to finish Jelly Bean's face. Step 7: Draw Jelly Bean's legs with some straight and curved lines. Step 8: Draw straight lines coming out at angles from the legs to start Jelly Bean's feet. Step 9: Draw a straight line down from the top of her foot. Then connect that line to the other side of her foot. Do this step carefully as it really helps to make the feet look 3D. 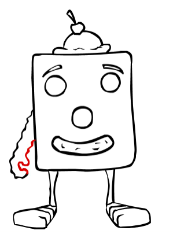 Step 10: Make 3 straight lines along the tops of Jelly Bean's shoes. Step 11: Now draw lines coming down from the lines in Step 10. This step completes the shoes, and makes them look 3D! 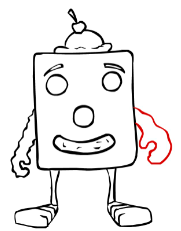 Step 12: Draw a very bumpy line to start Jelly Bean's jelly bean arm. Step 13: Finish off her bumpy arm. Step 14: Draw her other arm which is made of cotton candy. This arm is curvy, but not bumpy. Step 15: Draw in the extras. Step 16: Color Jelly Bean! This week's monster drawing lesson is going to teach you how to draw Glorious Gracie! 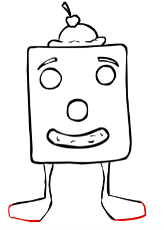 This lesson is a long one, but it is worth it to draw this happy, helpful monster! Glorious Gracie is a stylish monster. She loves to wear fancy clothing and shiny earrings. Glorious Gracie also has a crown that glows in the dark. It is fantastic because it helps her memorize her spelling words and math facts. Glorious Gracie is always happy. You will love her because her happiness is contagious! Thanks to Georgia B. from California for this stylish, happy monster! Step 1: Draw Gracie's special crown with straight lines, curved lines, and a diamond. Step 2: With more curved lines, draw the top of Gracie's hair. Step 3: Draw Gracie's face shape. Step 4: Using circles, draw Gracie's eye. Then draw a curve for her mouth. Step 5: Finish her mouth by drawing the lips. Step 6: Draw Glorious Gracie's neck. Step 7: Draw her dress. Straight lines can be drawn from her neck. Then add in long curved lines for the side of the dress. Then connect the lines by drawing a curved line across the bottom of the dress. Finally, draw an additional line for her bodice. Step 8: Draw 6 straight lines from the bottom of her dress. These will be the beginning of her legs. Step 9: Add straight lines to start her feet. Step 10: Each foot has three little curves. Gracie has feet like a duck! Step 11: Draw Glorious Gracie's arm. Step 12: Using straight lines, you can draw her other arm, that is bent, and her hand on her hip. Step 13: Draw one of Gracie's earrings by drawing a circle first on her ear. Then add a straight line going down. After that, add a rectangle, a diamond, and a circle to finish up her earring. Step 14: Draw the same type of earring on her other ear. Step 15: Add fun circles to her dress to make it spotted! Step 16: Add an extra layer of curves on Gracie's feet like she painted her toes. Step 17: Now, add in her long hair. You can make it as fun and crazy as you would like! Step 18: Color and have fun with Glorious Gracie!